Somebody was using fire in the manufacture of digging tools made of hard wood 170,000 years ago, in Tuscany. No hominin bones were found at the site, but the archaeologists investigating the extraordinary organic remains, discovered at Poggetti Vecchi during construction work and reported in PNAS, believe the mysterious manufacturer of the wooden foraging technology was early Neanderthal. There is no direct evidence of who the manufacturers at Poggetti Vecchi were. But the only known hominins in Europe at the time were Neanderthals, explains Biancamaria Aranguren, the Supervisor of Archaeology for Tuscany. That does not rule out other theories, especially given recent evidence that Homo sapiens itself both began evolving earlier than thought – at least 300,000 years ago, and may have begun spreading out of Africa some 200,000 years ago, based on a modern jawbone found in Israel. So theoretically the tool-maker of Tuscany could have been sapiens, or even another hominin. But given other evidence of Neanderthal dominion in Europe at the time, naming them is reasonable. Prof. Erella Hovers of the Hebrew University of Jerusalem, a worldwide expert on Neanderthals, stresses that Neanderthals are indeed the only known humans in Europe 170,00 years ago, based on the evidence of skeletal remains found so far. "The geneticists tell us that there may have been Denisovans in parts of Europe, though no such claim has been made for Italy, to the best of my knowledge," Hovers adds. 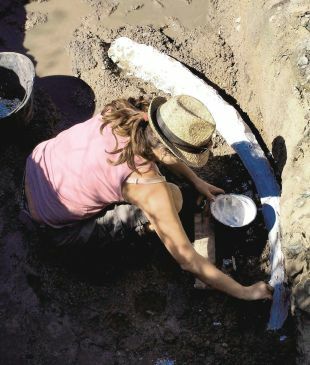 Poggetti Vecchi chronologically places between the quarter-million-year-old discovery at Saccopastore and the slightly "peculiar" Neanderthal skeletons of Altamura, which date around 150,000 years ago, Aranguren told Haaretz. Wood does not ordinarily survive millennia. Normally, it rots, degraded by bacteria and fungi. In this case, the fragmented but still identifiable remains of the prehistoric wooden tools were preserved by the humid paleoenvironmental conditions, Aranguren explains. The wood was found concentrated in a small area, together with (and even under) animal bones, chiefly of the extinct straight-tusked elephant Palaeoloxodon antiques – which were apparently not slaughtered using these implements. But it has been argued, based on morphological differences from us, that Neanderthals were heavy meat-eaters. Whoever made them, what they were making is digging tools, the archaeologists feel quite confident. Not spears, though the implements could be used to club small animals, among other things, they point out. All the sticks found were made of tough boxwood, and had broken over the years. Still, the archaeologists could tell they had been over a meter in length. The Poggetti Vecchi sticks were rounded at the handle end, and were pointed at the other, but not sharpened. Though extremely rare, other wooden artifacts from the Middle Pleistocene have been found, for instance at Clacton-on-Sea, Schöningen, and Lehringen – but they were different. They were longer and had been sharpened into real points, begging the theory that these ancient wooden tools had been actual spears. 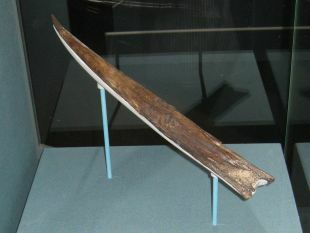 The Lehringen spears, for one, were found near elephant bones. "The Schöningen spears are around 1.82 to 2.25 meters long, with diameters of around 3 to 5 centimeters," Aranguren told Haaretz. "They are made from pine or spruce wood, equipped with one or even two sharpened tips. The Poggetti Vecchi wooden tools are around 100 to 120 cm long with an average diameter of 3 cm. They are made from boxwood and had a blunt point and a rounded handle." In short, says Aranguren, "the morphometric characteristics of the Poggetti Vecchi wooden tools (rounded handles, blunt points and dimensions) recall those of the so-called 'digging sticks,' multipurpose tools which are used not only for gathering plants (roots and tubers) and as a pestle, but also for hunting small game, especially burrowing animals, and as a club. They are not spears because they didn't have sharpened points, are too short, and are not balanced for throwing." Ergo, you could throw one of these Neanderthal sticks, but it probably wouldn't hit your target. That's a sign they were used for other things. Aranguren also points out that the makers of the Schöningen spears were apparently Neanderthals too, even earlier ones, as the tools are twice as old as the Poggetti Vecchi digging sticks. Charring on the sticks led to the postulation that the Neanderthals exploited fire to render the dense boxwood, the hardest wood in Europe, easier to scrape into the shape they wanted. Making the digging tools involved more than removal of the bark and branches (which left cut and scratch marks on the wood) and shaping the tips: the researchers found a burnt film on some of the artifacts. Researchers have previously surmised that primitive men used fire to work wood more easily with their stone tools. "The use of fire facilitates the removal of the burnt outer bark using thick flakes or abrasive stones," the writers explain. It seems, based on the evidence, that the Neanderthals could exploit fire to perfect their tools. It does not necessarily mean they could control fire to the extent of being able to ignite it at will. Researchers generally assume that during the Middle Pleistocene, when Poggetti Man lived, there was regular use of "natural" fire – for instance brushfire ignited by lightning, Aranguren explains. When fire-making technology developed is highly controversial. 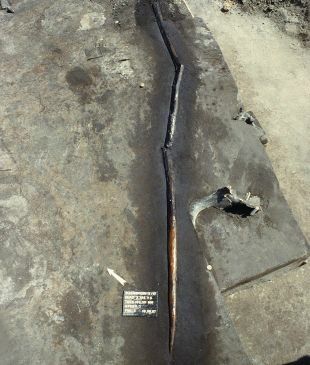 "Poggetti Vecchi, that dates to the final Middle Pleistocene, offers the earliest evidence of the use of fire to work wooden implements," Aranguren stresses. "We know that to make digging sticks, Neanderthals needed to have the knowledge and ability to contain, feed, and extinguish fire; we cannot say with certainty that they had also the knowledge and technology necessary to create fire at will." Further evidence is deliberate manufacturing includes cut marks and striations made by stone tools on the sticks. The archaeologists also found some stone tools in the proximity of the wooden tools. Whether or not the tools were "typical" of Neanderthal as opposed to some different species of man is again an open question: argument has been raging over who invented what sort of stoneworking technology, and the jury remains out.